Pope Martin V convoked the Council of Basel in 1431. 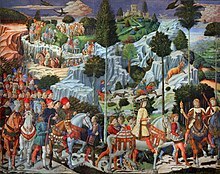 It became the Council of Ferrara in 1438 and the Council of Florence in 1439. The initial location at Basel reflected the desire among parties seeking reform to meet outside the territories of the Papacy, the Holy Roman Empire[disputed – discuss] or the kings of Aragon and France, whose influences the council hoped to avoid. Ambrogio Traversari attended the Council of Basel as legate of Pope Eugene IV. The Council was seated on 14 December 1431, at a period when the conciliar movement was strong and the authority of the papacy weak. The Council at Basel opened with only a few bishops and abbots attending, but it grew rapidly and to make its numbers greater gave the lower orders a majority over the bishops. It adopted an anti-papal attitude, proclaimed the superiority of the Council over the Pope and prescribed an oath to be taken by every Pope on his election. On 18 December Martin's successor, Pope Eugene IV, tried to dissolve it and open a new council on Italian soil at Bologna, but he was overruled[clarification needed]. In the following months, agreement was reached on the Western doctrine of Purgatory and a return to the pre-schism prerogatives of the Papacy. On 6 July 1439 an agreement (Laetentur Caeli) was signed by all the Eastern bishops but one, Saint Mark of Ephesus, who, contrary to the views of all others, held that Rome continued in both heresy and schism. ^ a b c "Florence, Council of", Oxford Dictionary of the Christian Church, Oxford University Press, 2005, ISBN 978-0-19-280290-3 . ^ Shaw, Russell (2000). Papal Primacy in the Third Millennium. Our Sunday Visitor. p. 51. ISBN 0879735554. ^ "John Argyropoulos". www.britannica.com. Retrieved 2009-10-02. Argyropoulos divided his time between Italy and Constantinople; he was in Italy (1439) for the Council of Florence and spent some time teaching and studying in Padua, earning a degree in 1443. Sebastian Kolditz, Johannes VIII. Palaiologos und das Konzil von Ferrara-Florenz (1438/39). 2 Vol., Stuttgart: Anton Hiersemann Verlag 2013-2014, ISBN 978-3-7772-1319-4. Stuart M. McManus, 'Byzantines in the Florentine polis: Ideology, Statecraft and Ritual during the Council of Florence', Journal of the Oxford University History Society, 6 (Michaelmas 2008/Hilary 2009) "issue6(michaelmashilary2009) (jouhsinfo)". Jouhsinfo.googlepages.com. 2009-03-14. Retrieved 2010-01-18. Stefan Sudmann, Das Basler Konzil: Synodale Praxis zwischen Routine und Revolution, Frankfurt-am-Main 2005. ISBN 3-631-54266-6 "Peter Lang Verlagsgruppe". Peterlang.com. 2010-01-14. Retrieved 2010-01-18. This article incorporates text from a publication now in the public domain: Chisholm, Hugh, ed. (1911). "Basel, Council of" . Encyclopædia Britannica (11th ed.). Cambridge University Press.